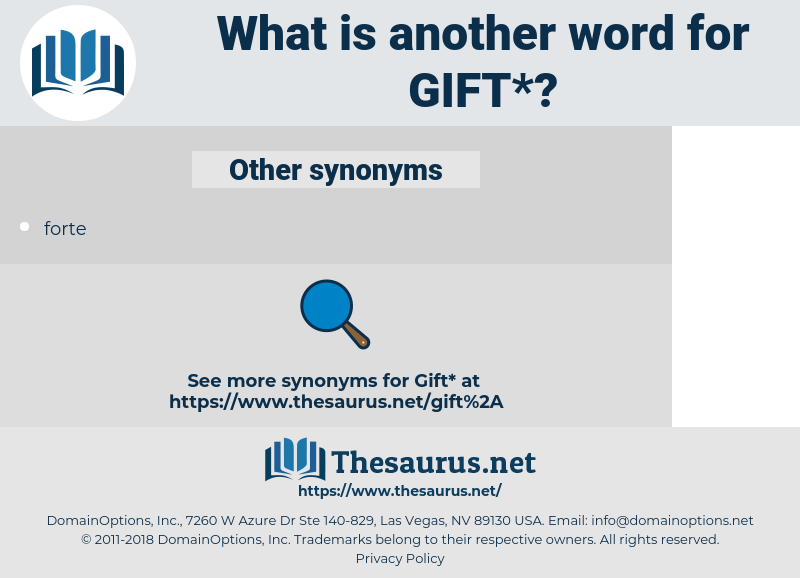 What is another word for gift? Conveyancing. A voluntary conveyance; that is, a conveyance not founded on the consideration of money or blood. 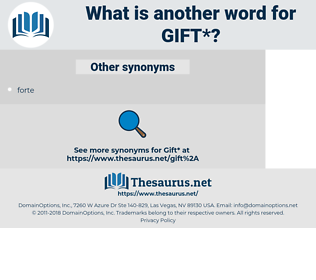 The word denotes rather the motive of the conveyance; so that a feoffment or grant may be called a gift when gratuitous. A gift is of the same nature as a settlement; neither denotes a form of assurance, but the nature of the transaction. Watk. Prin. 199, by Preston. The operative words of this conveyance are do or dedi. The maker of this instrument is called the donor, and he to whom it is made, the donee. 2 B. Com. 316 Litt. 69; Touchs. ch. 11. Gifting, giftware, donation, knack, flair. articles, data, vows, blessing, poison, giver, endowment, boon, merchandise, genius, ceremony, pledge. inability, incompetence, surrender, incapacity, impotence, ineptitude, lack, failure, ineptness, miss. disability, advance, earnings, peace offering, sop, penalty, guerdon, Douceur, shortcoming, wages, loan, handicap, weakness, remuneration, bribe, compensation. Don't you believe he's going to take any little Christmas gift this time! Esther, he said, I want to tell you, to make you believe what a great gift you have. bride price, freebee, award, financial aid, dowery, lagniappe, giveaway, largesse, aid, contribution, dowry, assistance, economic assistance, bestowment, enrichment, devise, gift horse, economic aid, free lunch, freebie, financial assistance, bequest, portion, present, bestowal, dower, legacy, donation, largess, prize. donate, regift, tip, grant, will, submit, dower, raffle off, fee, treat, give out, hand out, endow, bequeath, deliver, give up, deed over, bung, pass out, cede, tender, distribute, raffle, give away, surrender, leave, render.